In just a few days, we will welcome the world to Atlanta with one of the biggest and best Rotary conventions ever. 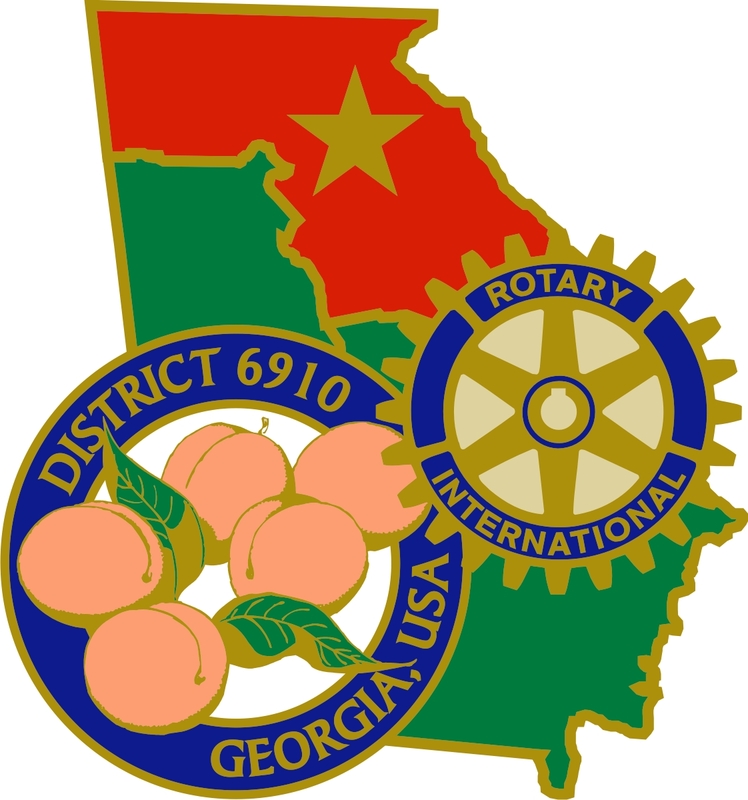 We now have 688 registered from Rotary District 6910. It is not too late for you to join in on the fun, inspiring speakers, and fellowship. Learn more here. We have so much to celebrate in reflecting on the past year of Rotary Serving Humanity and 100 years of doing good in the world through our Rotary Foundation. 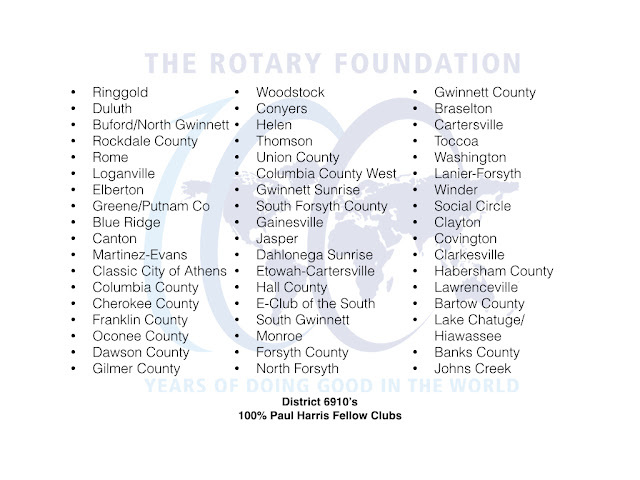 To date, we in District 6910 have had a record year of giving to The Rotary Foundation. 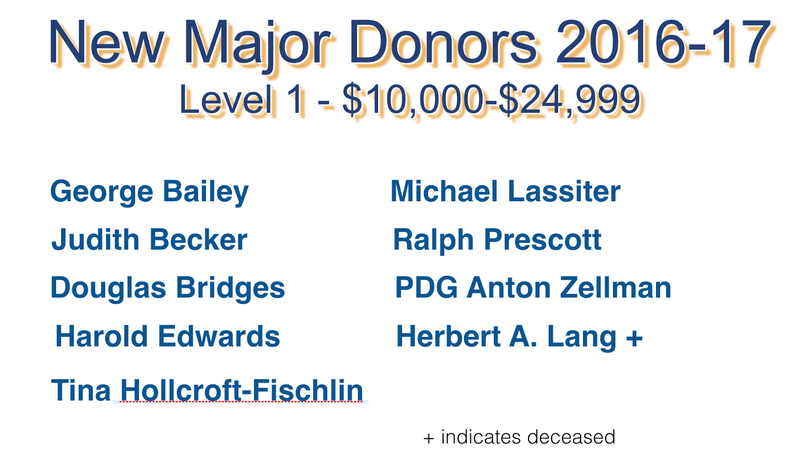 We are approaching an outright giving total of $1 million with $974,444 on the books as of today. Thank you for your generous gifts this year. With another month left, I think we could top $1 million. 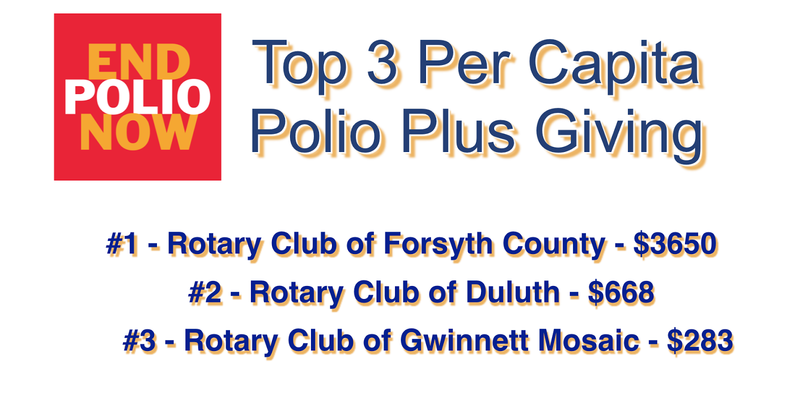 If you haven't recently made a contribution to The Rotary Foundation, please consider doing it today. The good we do is fueled by what we give. 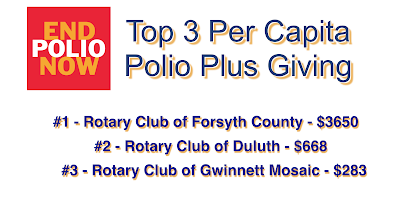 Give by clicking here. 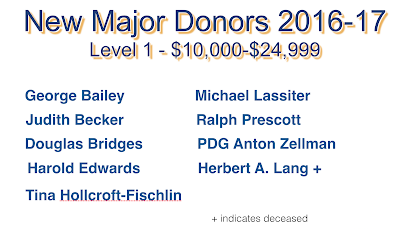 Not only will we be celebrating our gifts of outright cash, but we will celebrate the bequest gifts that made the Million Dollar Dinner possible with Rotary International President John Germ. 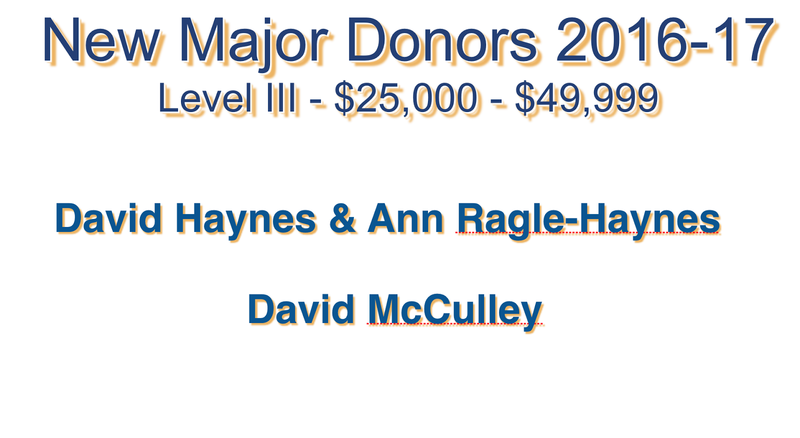 Our increased giving was due in large part to so many clubs becoming 100% Paul Harris Fellow Clubs this year. 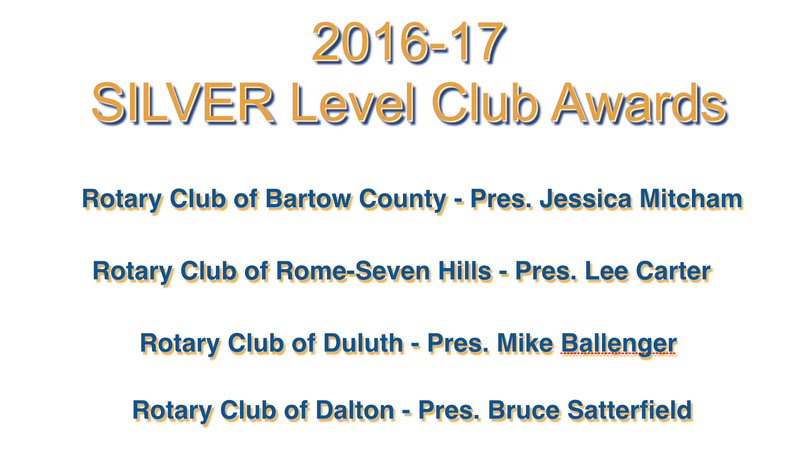 Congratulations and thank you to the clubs in District 6910 who have accomplished this outstanding achievement. District Assembly on May 13 was a wonderful event with outstanding clubs and individuals in Rotary District 6910 receiving awards and recognition. 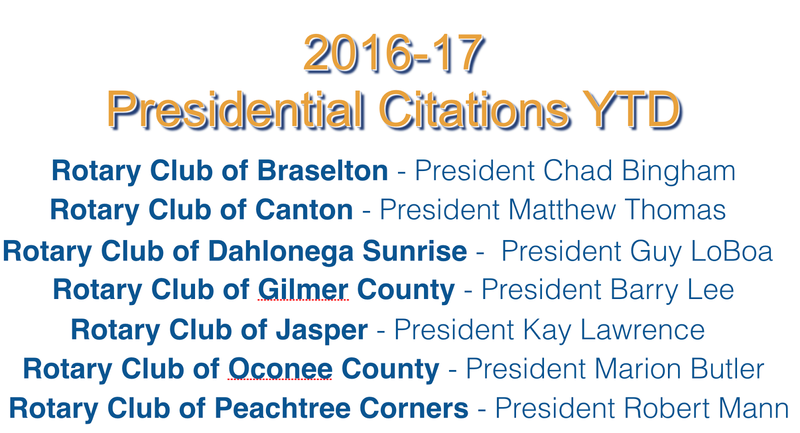 Each district governor establishes guidelines as suggestions for clubs to operate most effectively. 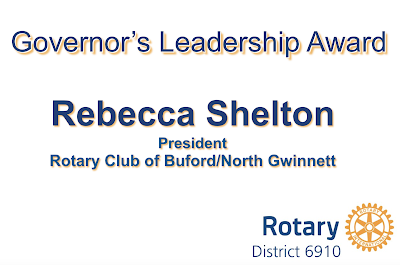 Each of these guidelines has points for accomplishments made throughout the year in the areas of The Rotary Foundation, Club Administration, Leadership, Membership, Public Image, Service, International Service, Vocational Service, Youth Service and Georgia Rotary Student Program (GRSP). These goals and guidelines typically reflect the goals of the Rotary International President. Clubs compete with one another in achieving points to become Club of the Year in each category of club - Small (2-29 members); Medium (30-59 members); Large (60-90 members) and Extra Large (91+ members). 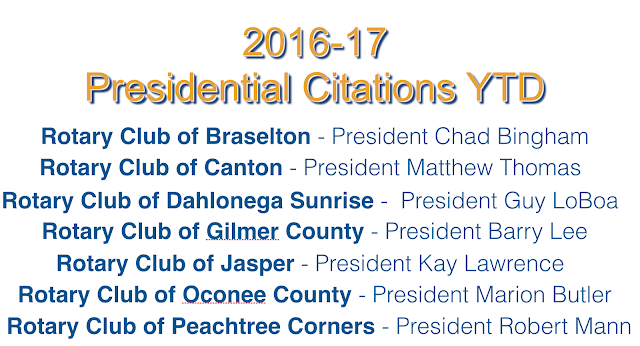 In years past, these were awarded at District Conference. This year, awards and recognition took place at district assembly on May 13. 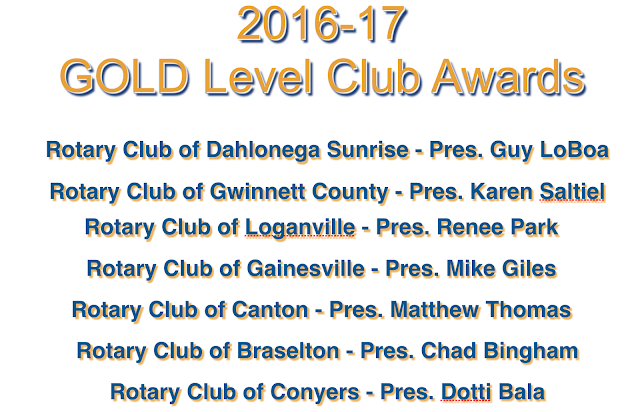 Congratulations to our outstanding Clubs of the Year! 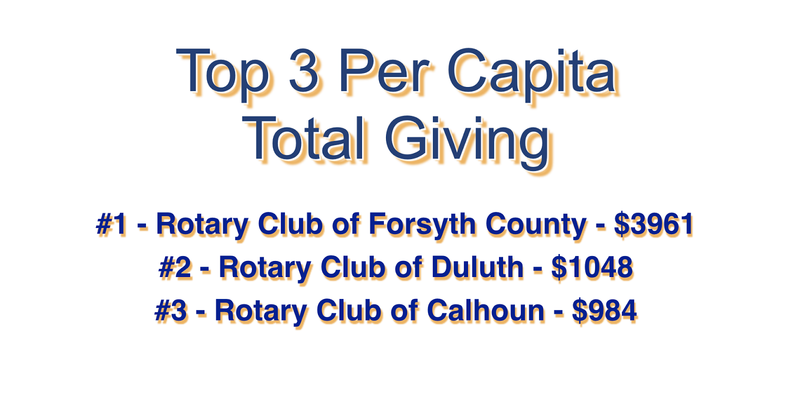 Clubs were recognized as top per capita giving clubs. 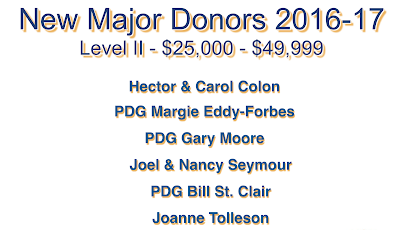 We have never seen this number of new major donors in any given Rotary year in District 6910. 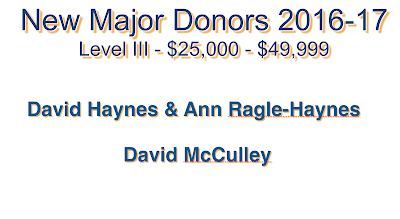 Again, thank you for your generous giving. 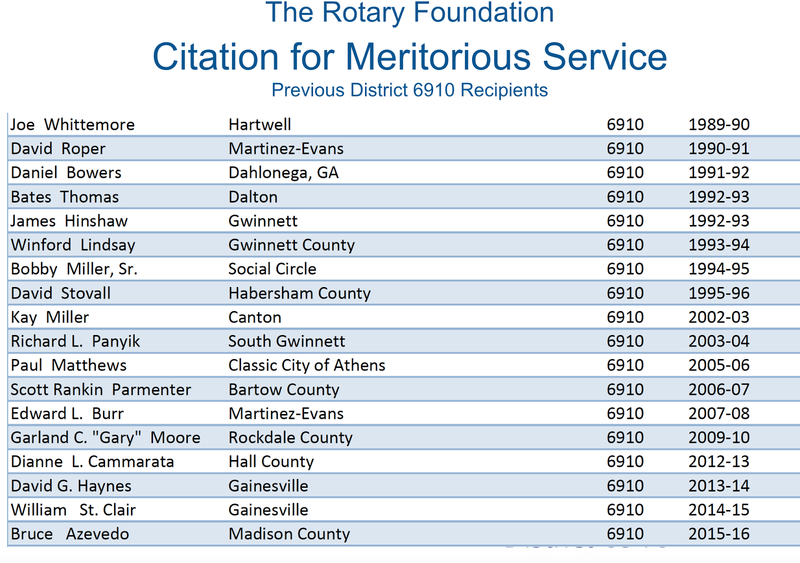 The Rotary Foundation Citation for Meritorious Service recognizes individual Rotarians who have demonstrated outstanding active service to The Rotary Foundation for more than one year. 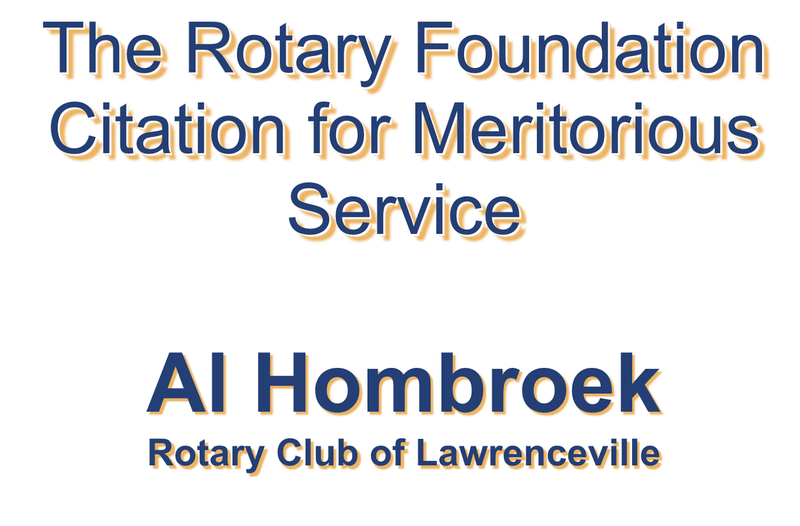 Rotarian Al Hombroek of The Rotary Club of Lawrenceville received The Rotary Foundation Citation for Meritorious Service. 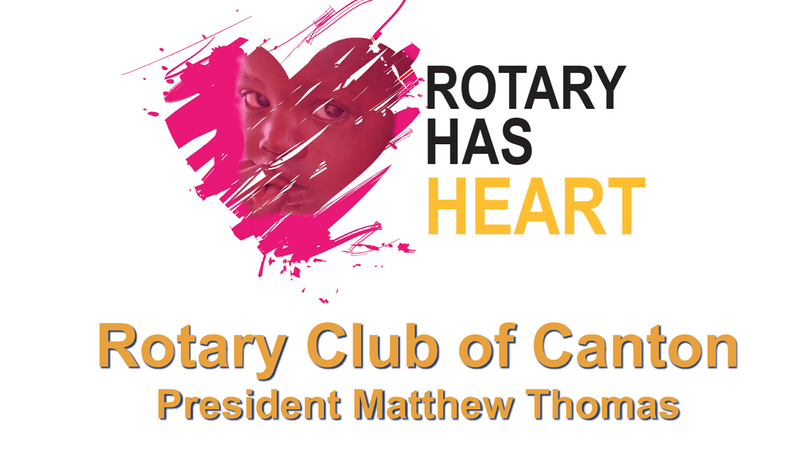 Twenty-four clubs participated in Rotary Has Heart programs in February, food projects in their local communities. 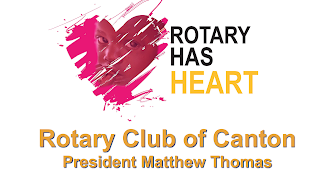 The Rotary Club of Canton won the Zone 34 Rotary Has Heart Competition for its ongoing comprehensive project addressing many needs, including those who are food insecure. 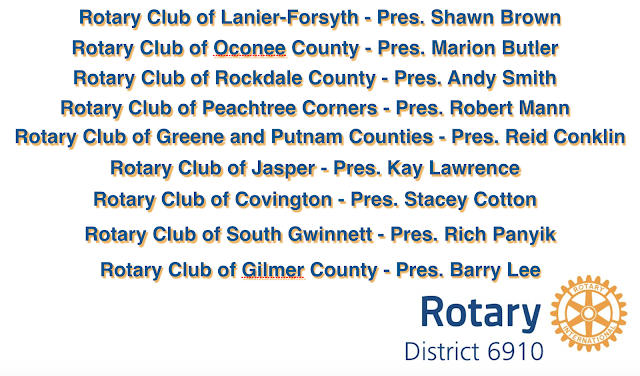 The following clubs received Rotary Zone 34 Public Image Citations for outstanding achievements in the area of public image and communications. Congratulations on this achievement! 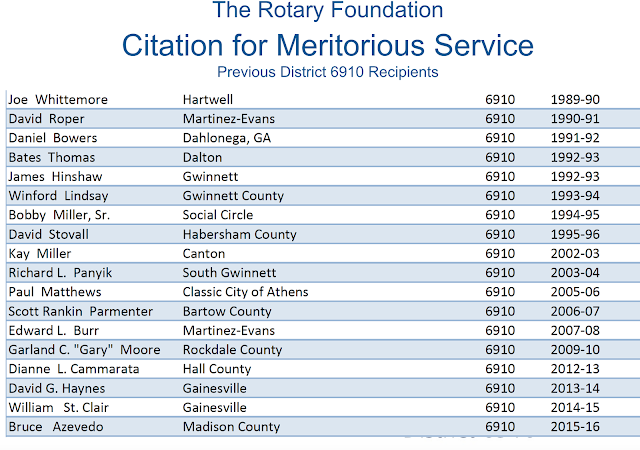 Club Presidents have until the end of June to get accomplishments in at Rotary Club Central for Rotary International President John Germ's Presidential Citation. 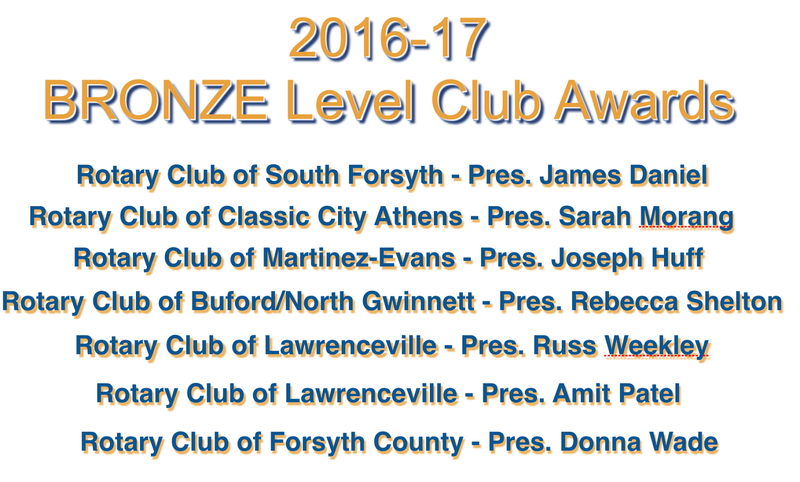 Clubs were recognized who had achieved this outstanding accomplishment. 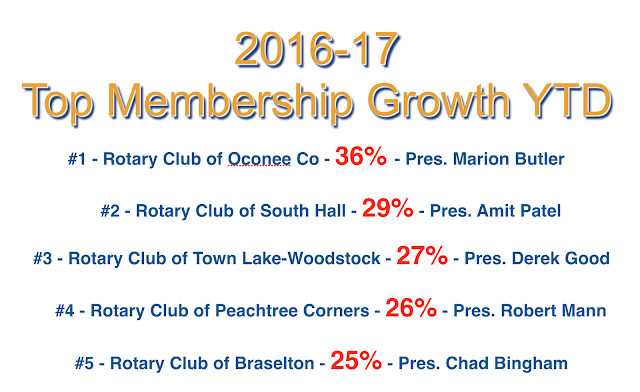 These are the top performing clubs in Rotary District 6910, according to the criteria set forth by President John Germ. Membership remains the number one internal goal in Rotary. Clubs who have made outstanding achievements in membership growth were recognized. 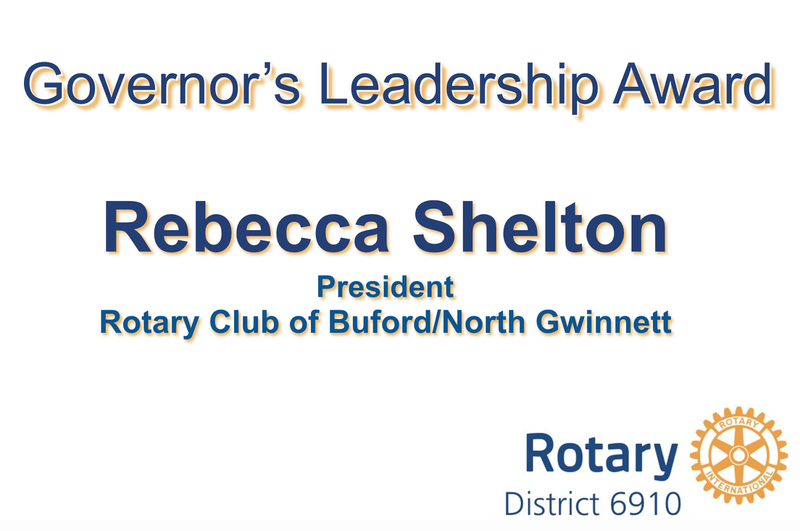 The Rotary District 6910 Guardian of Ethics Award recognizes an individual who has made outstanding contributions in his or her vocation and who has by his or her actions, writing, policies and public pronouncements strengthened and fostered development of ethical practices. 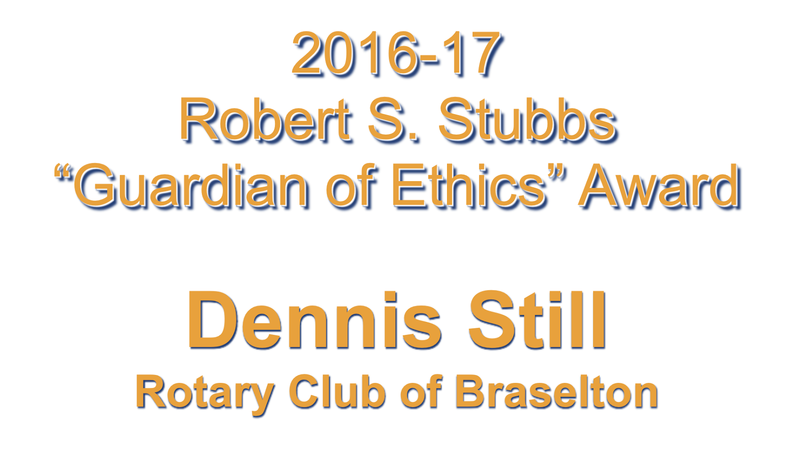 The Guardian of Ethics Award was named for Robert "Bob" Stubbs of The Rotary Club of Canton, and was established to promote ideals of ethics. 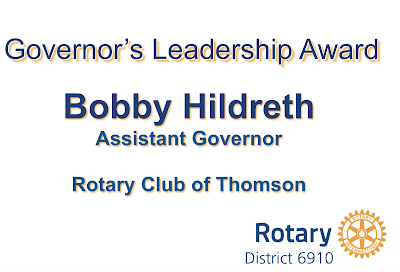 This club and district level vocational award identifies a Rotarian who exemplifies the attributes and passion for ethics in his or her vocation, business and personal life that Bob Stubbs so exemplified. 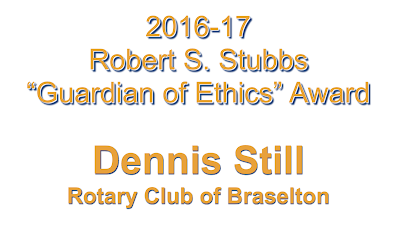 Dennis Still of The Rotary Club of Braselton received the Guardian of Ethics Bob Stubbs Award. 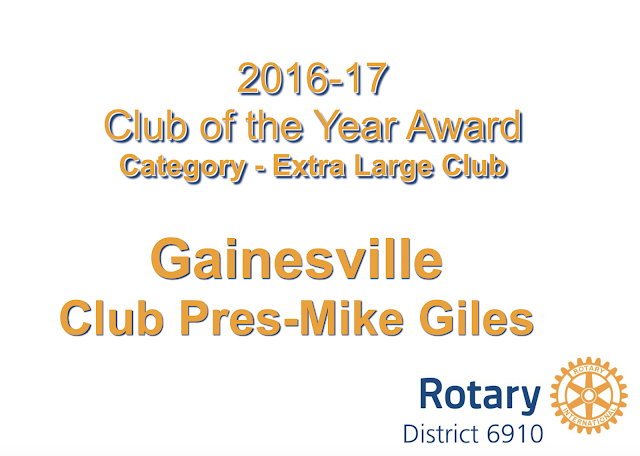 He is the first Rotarian to have received both the W. Lee Arrendale Award for Vocational Excellence and The Guardian of Ethics Award. 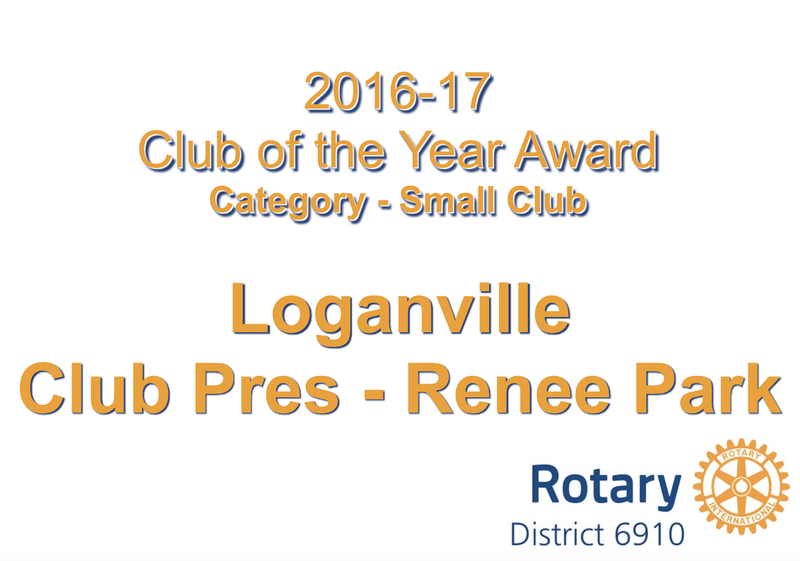 The Rotary District 6910 W. Lee Arrendale Vocational Excellence Award was named for Lee Arrendale, a leader in the poultry industry. 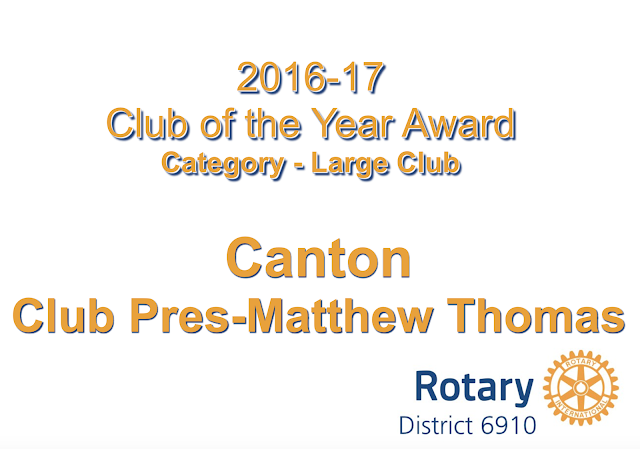 He was a charter member of The Rotary Club of Habersham County. 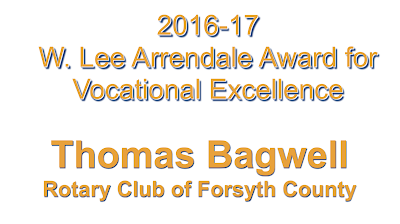 This recipient is recognized for excellence in his or her vocation, achievements in the community and academic achievements. 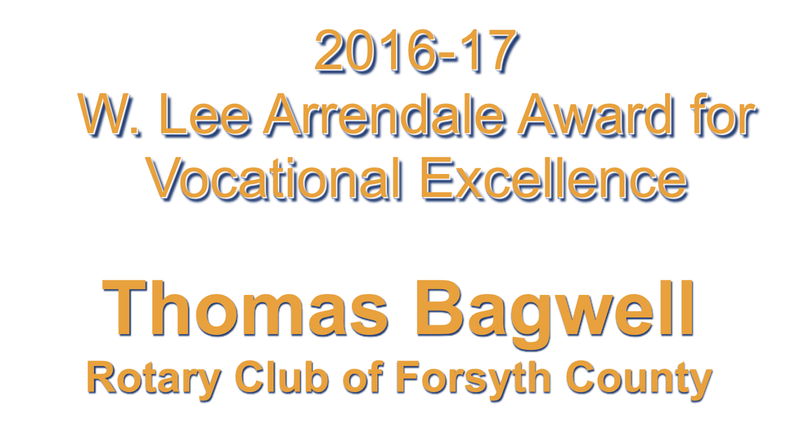 This year's W. Lee Arrendale Vocational Excellence Award was present to Tommy Bagwell of The Rotary Club of Forsyth County. Tommy served as the club's charter president in 1975. 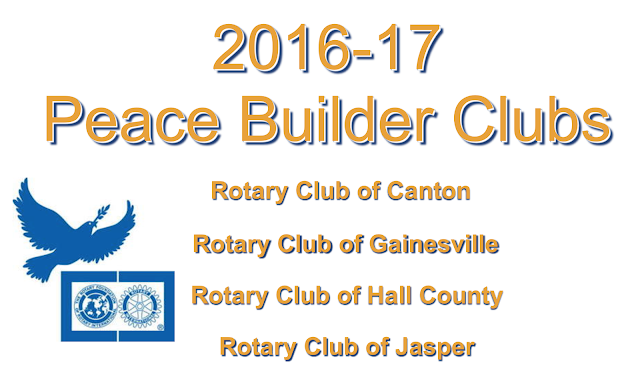 Rotary District 6910 officially became a Peace Building District in 2016-17. In its inaugural year as a peace building district, four clubs were recognized as peace building clubs for having submitted a peace project with at least one member joining The Rotarian Action Group for Peace. The most highly effective clubs were those achieving Gold, Silver and Bronze Level Recognition for Club Awards Points. 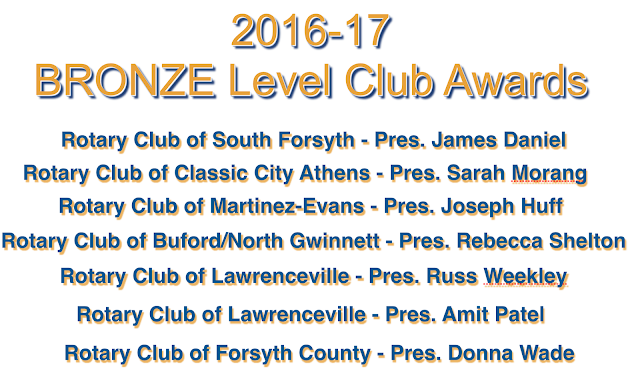 Gold Level clubs achieved 80% of total club awards points possible; Silver Level clubs achieved at least 75% of total points possible and Bronze Level clubs achieved 65% of total points possible. 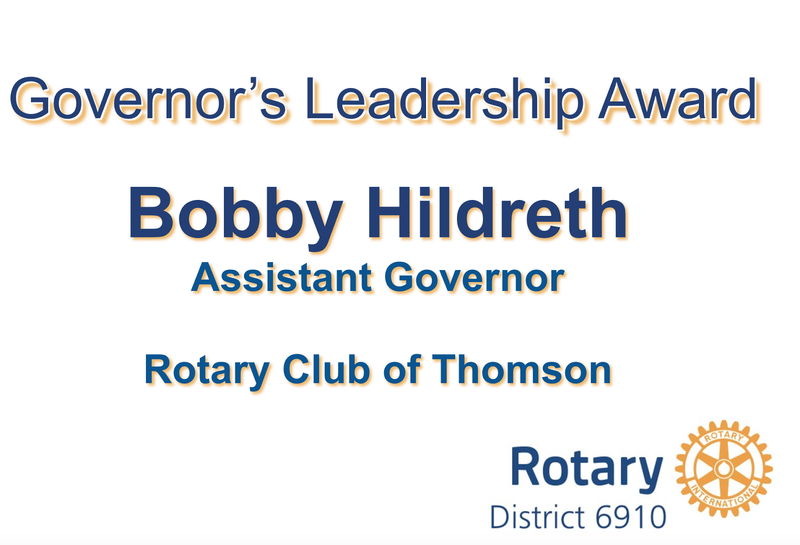 Governor's Leadership Awards are presented at the district governor's discretion to Rotarians who exemplify outstanding leadership and hard work. A club president and assistant governor were recognized this year for outstanding leadership and work toward achieving a polio-free world and strengthening their Rotary clubs. Thank you, Bobby and Rebecca! 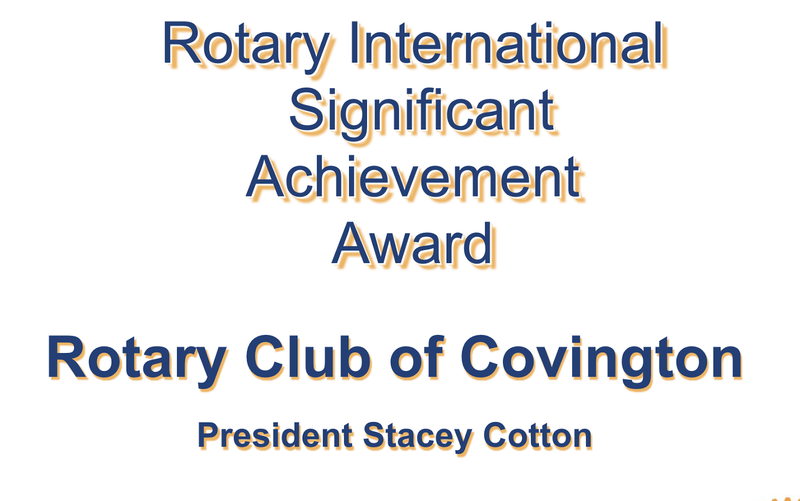 The Rotary International Significant Achievement Award recognizes outstanding club projects addressing a need or problem in the community. 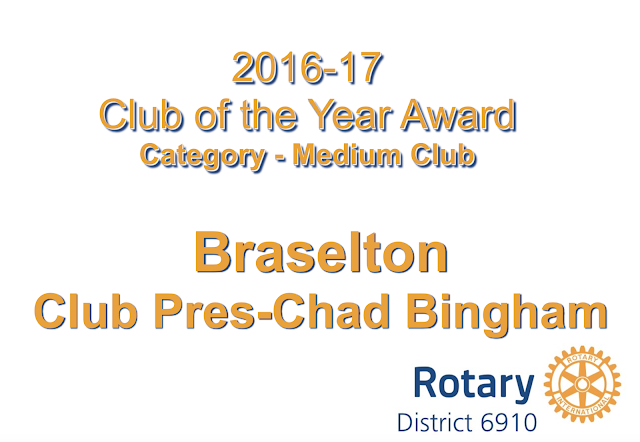 In an average year, approximately 200 clubs out of over 34,000 receive this prestigious award. The Rotary Club of Covington received this award for their Empty Stocking project. 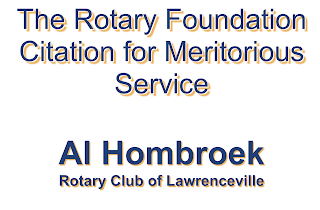 Rotary's highest honor, the Service Above Self award recognizes up to 150 Rotarians each year who demonstrate their commitment to helping others by volunteering their time and talents. Peter Gleichman, Past Assistant Governor of the Rotary Club of Canton, was one of only 117 Rotarians in the world to receive this prestigious award. 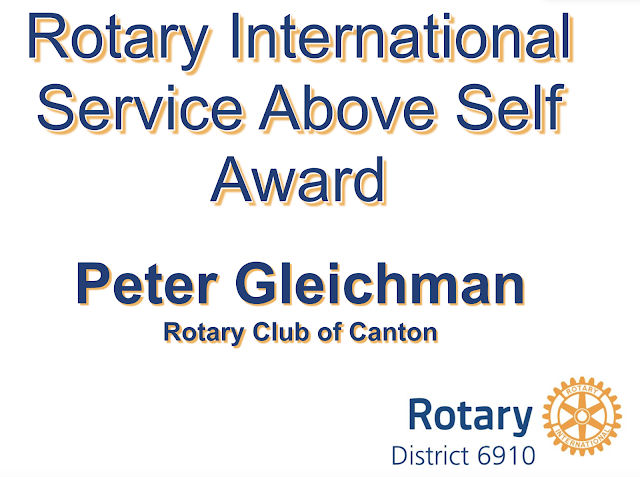 Congratulations, Peter, on this well deserved honor!